Managing your employee learning and talent management in separate systems is hard. It can take hours or days of data wrangling to understand the relationships between learning and performance, engagement, and retention. Integrating learning with your other HR systems can save you hours of manual work. It can make it possible to analyze your data without wrestling spreadsheets. 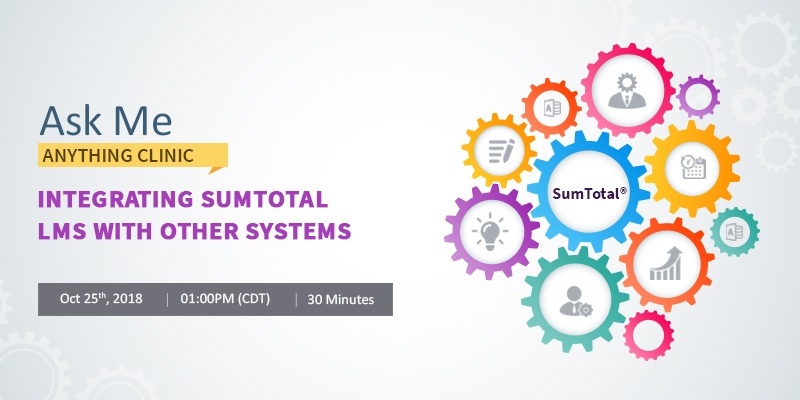 Join our free Ask Me Anything Clinic about Integrating your SumTotal LMS with other systems. Avoid information duplication, reduce manual entry time, and avoid data errors. Give your managers instant access to learning and talent data they need to coach and develop their teams. Ease the burden of manual data manipulation for your administrators.